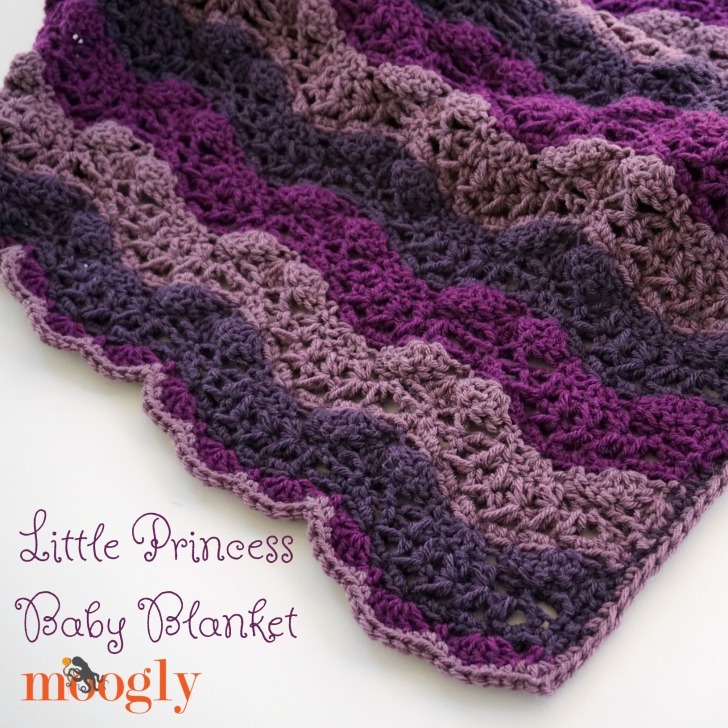 Little Princess Baby Blanket - FREE #Crochet pattern on Moogly! 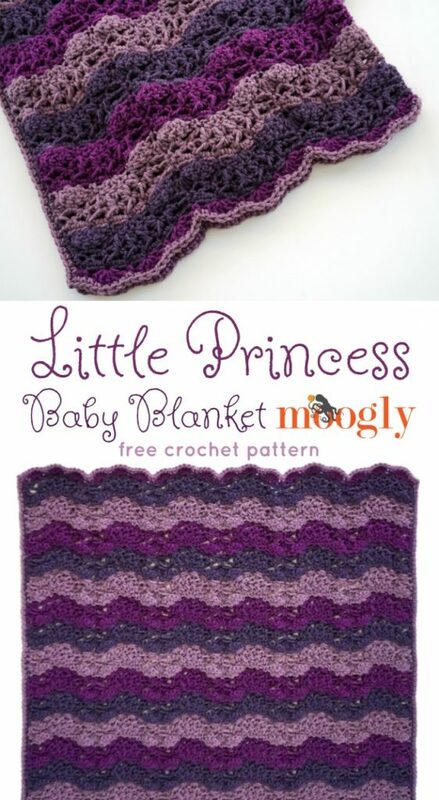 The Little Princess Baby Blanket is fit for royalty – but available to all – with this free crochet pattern on Moogly! Disclaimer: This post includes affiliate links; yarn provided by Lion Brand; hook provided by Furls; no princesses were harmed in the making of this blanket. 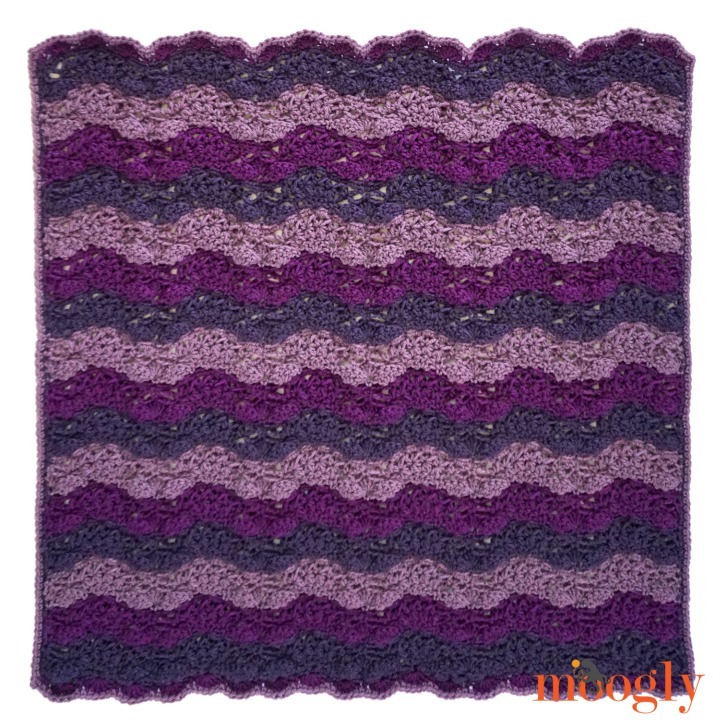 The Little Princess Baby Blanket features a gentle “royal” wave and regal shades of purple. But because it’s for the littlest princesses, it’s made with easy care 100% acrylic Lion Brand Vanna’s Choice – so you don’t need a team of nannies to take care of it! 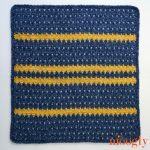 Get this pattern as a Lion Brand Kit – including the yarn! Cluster: (Worked as an hdc2tog over the previous stitch and next stitch) – Yo and insert hook in same st as previous st, yo pull up loop (3 loops on hook), yo and insert hook in next st, yo and pull up loop (5 loops on hook), yo and pull through all 5 loops on hook. Wide Cluster: (Worked as an hdc2tog over the previous stitch and next stitch, skipping the ch-sp in between the stitches) – Yo and insert hook in same st as previous st, yo pull up loop (3 loops on hook), skip the next ch-sp, yo and insert hook in next st, yo and pull up loop (5 loops on hook), yo and pull through all 5 loops on hook. The “wave” or ripple shape isn’t apparent until Row 3 or so, so do not panic if you don’t see the wave shape right away. If preferred, substitute the CSDC (tutorial linked above) for the ch 3 at the beginning of Rows 2 and 6. You can carry or “float” the yarns along the side to avoid cutting the yarn after each repeat – see the linked tutorial above for more info. Rows 2-4 and 6-8 are identical, but for ease of use (as the color repeat runs for Rows 5-8), they are given in full in the pattern. Rows 9 – 64: Repeat Rows 5-8, switching colors every 4 rows (finishing with a Color A stripe). At the end of Row 64, do not turn. Break Colors B and C.
Edging Round 1: Ch 2, and turning blanket 90 degrees, sc evenly along side of blanket; at the corner, ch 2; working across the foundation chain, sc in 1st st, *3 sc in next ch-sp, sc in next st, [2 sc in next ch-sp, sc in next st] 4 times, 3 sc in next ch-sp, sc in next st, rep from * across to corner; at the corner, ch 2; sc evenly along last side of blanket; join to first st of Row 64, break yarn. Edging Rows 2 (Worked ONLY across top and bottom edges of blanket): With Color B, join to ch-2 corner with sc, sc in next st, *skip 3 sts, 5 dc in the next st, [skip 2 sts, sc in the next st, skip 2 sts, 5 dc in the next st] twice, skip 3 sts, sc in the next st; rep from * across, sc in next ch-2 sp, break Color B. Repeat on the other end of the blanket. Edging Round 3: With Color C, join to any st with sc, sc evenly around entire blanket working a ch-2 at each corner. Break Color C and weave in all ends. The Little Princess Baby Blanket is sweet, feminine, and oh so pretty. 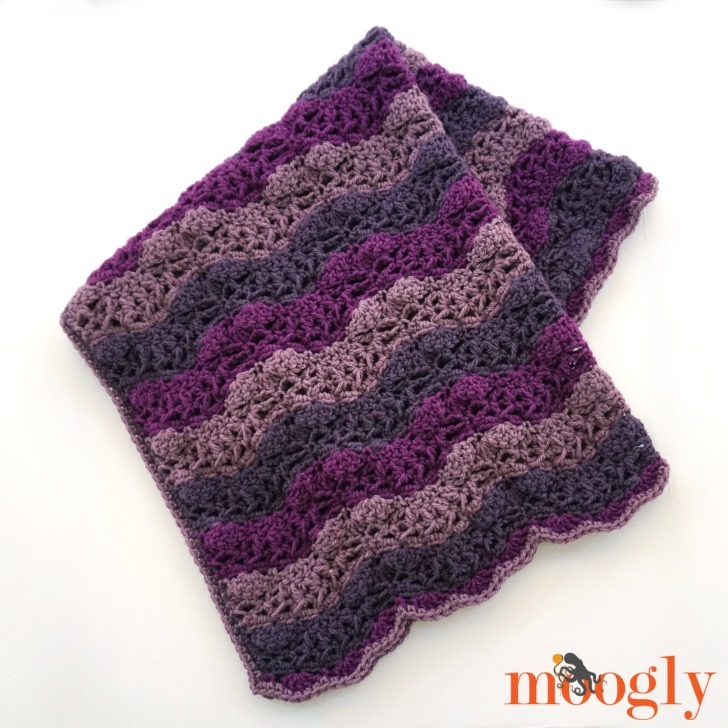 If you want to make a grownup version, please see the stitch multiple above to create your own custom size of this free crochet blanket pattern! I love seeing your finished projects! 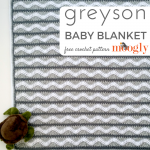 If you share your Little Princess Blanket on Twitter or Instagram, be sure to tag me @mooglyblog – and if you’re on Facebook, I’d love to see your photo on the Moogly Facebook page! 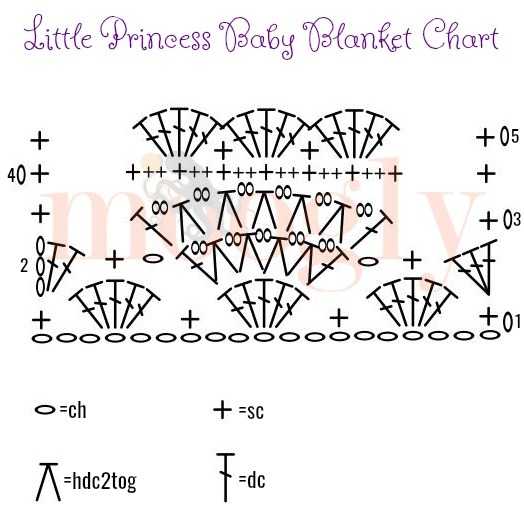 I want to make the Little Princess Baby Blanket in full size. How many stitches across do I start with on the first row? Love the color combinations! I am going to put this one on my “To Do” list for my local women’s shelter. Twenty five years ago I was one of those women with a 6 month old baby and was gifted with a beautiful sunny yellow crocheted blanket…which I still have! I am in a much better place now and always try to remember to pay it forward! “The greatest effects we have on the world are the ones we can never see”. The previous stitch is the stitch just made – so if you work a stitch in the same stitch as the previous stich, it’s telling you to go back and work into the same stitch again. Does that help? Could you please make a chart for this pattern? I find charts to be very helpful. Thank you! That would be so helpful, as I am still pretty stuck and would really love to be able to visualize this. Did you ever figure this pattern out? If so, can you give me some pointers. It is very confusing and hard to follow. My daughter, who is my crochet guru can’t even figure it out. cut and weave. This is so much easier and very much appreciated. Thank you for making so many beautiful patterns! 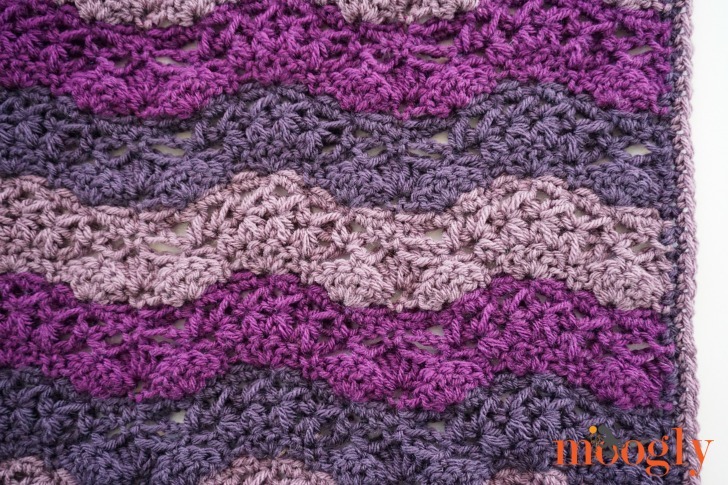 The gauge is 7 rows = 4″, so if you want to make a 60″ throw, you’d make approximately 105 rows. 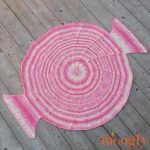 Since this blanket used 876 yds for 1296 square inches (36″ x 36″), you’d want approximately 2030 yds of yarn for a 50″ x 60″ throw (3000 square inches). Ok, thank you, that makes sense! Thanks for the help!! – it looks great now. Love your site and patterns. Hi Kim! I’m a little confused – Row 2 begins and ends with 3 dc in the first/last stitch, but Row 3 should end with a sc. Thanks for responding so quick. I am actually having trouble with the ending on row 2. Sorry about that. When I get to the end of row 2 do I skip the xtra stitches and go to the last stitch and do 3 DC? The way my row 2 works out I would do the 5 DC and have 4 stitches left. I hope this explains my problem better. I think I figured out row 2 but I am now having trouble with row 3. You do not address the chain 2 spaces at all. When you state to skip a ch1 space, do I skip ch2 space? Hi Kim! There is now a chart included – hopefully that helps! Like everyone else, I’m struggling with row 3. You address in the pattern skipping the chain 1 spaces from row 2 but what about the chain 2 spaces? Do we stitch into the space? Into the second chain? If you could provide a chart or a tutorial it would be great! Even if the tutorial is not of a 110 stitch chain. I love the pattern but I’m at my wits end trying to make it work. The chart was PERFECT! It answered all my questions and I was able to complete the blanket! Thank you so much! Oh I’m so glad to hear it! Thank you!